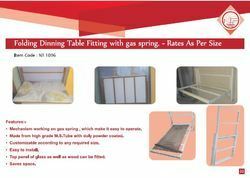 Leading Manufacturer and Supplier of Table Fitting such as New Aluminium Dinning Fitting, M.S. Dinning Table Fitting, Writing Table Fitting and M.M. 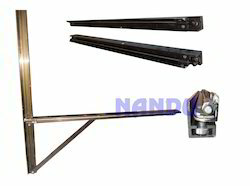 Folding Bracket from Mumbai. Backed by rich experience, we have emerged as the leading manufacturer and supplier of a wide range of M.S. Dinning Table Fitting that is made from raw material, the best available in the market procured from the certified vendors of the market. The entire range is sternly inspected by our quality personnel to assure quality in compliance with global quality standards before offering to our treasured clients. Size: 20, 24, 30, 36, 40, 48, 60"
Backed by diligent professionals, we are providing highly advanced M.M. 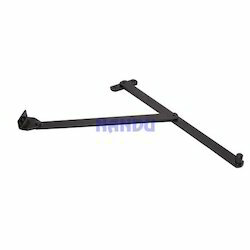 Folding Bracket. 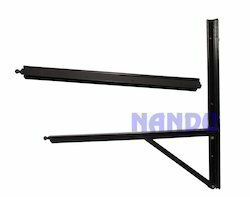 We are leveraging the prevailing technology to bring forth the innovative designs of folding brackets that are trusted widely for fitting movable tables and shelves. These brackets are made from industry approved grades of steel alloy and finished with powder coating to assure durability. Further, the offered range can be ordered in 12, 15, 18, 20 and 24" sizes at a nominal price. Our vast years of experience and knowledge have made us the leading manufacturer and supplier of New Aluminum Dinning Fitting. Offered range is precisely manufactured using high quality approved raw material with advance technology in our high-tech manufacturing unit. The entire range is precisely inspected by our quality personnel to assure quality in compliance with universal quality standards. This product is availed in accordance with the client’s specific requirements through our customization facility. Size: 24, 30, 36, 48, 60"
We are well known enterprise engaged in developing highly viable Writing Table Fitting. Utilized widely at homes, offices and libraries the offered fitting accessory is the best suited hardware for space saving designs. Fabricated from finest grade raw materials using the latest manufacturing technology, this robust quality frame is easy to fit on standard sizes of writing tables. Finished in classic black color and rigorously tested for its strength, the offered table fitting can be ordered from us at a competitive price. • Mechanism working on gas spring , which make it easy tooperate. • Made from high grade M.S.Tube with duly powder coated. • Customizable according to any required size. • Top panel of glass as well as wood can be fitted.